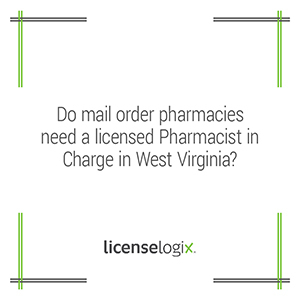 All Mail Order Pharmacies licensed in West Virginia must have a West Virginia licensed Pharmacist in Charge (PIC) by June 30th, 2014. This date coincides with the WV annual license renewal deadline and the license will not be renewed unless the pharmacy has a PIC licensed in WV. Per West Virginia Code 30-5-7(a)(13), "Regulation of mail order pharmacies: Provided, That until the board establishes requirements that provide further conditions for pharmacists whom consult with or who provide pharmacist care to patients regarding prescriptions dispensed in this state by a mail order pharmacy, the pharmacist in charge of the out-of-state mail order pharmacy shall be licensed in West Virginia and any other pharmacist providing pharmacist care from the mail order pharmacy shall be licensed in the state where the pharmacy is located." To obtain a license as a Pharmacist in West Virginia, all applicants must request the license through NABP, prepare an Official application for the West Virginia Board of Pharmacy, and pass the Multistate Pharmacy Jurisprudence Examination (MPJE). The West Virginia licensed PIC does not need to be the home state PIC. All other pharmacists working under the PIC simply need a valid pharmacist license in the state where the pharmacy is located. LicenseLogix will begin the Pharmacist licensing process TODAY. Our skilled Account Managers seamlessly navigate the filing process on your behalf. If you are already licensed, we can manage license renewals and ongoing license compliance. To get started, click here or call us at 1-800-292-0909.